InterBrand has named this years best global brands and there’s a lesson in there for every company, regardless of sector. Throughout this blog I have written about ways that hoteliers can use social media to surprise and delight guests. Since the time seems right, I will now include 5 favorites. Revinate customers will be able to easily identify almost all of these opportunities using Social Media Searches and the other tools in Revinate. Keep your eye on Twitter for mentions of your property. As soon as people check-in or Tweet about being on site, acknowlede them. Send them a message or a tweet welcoming them to the hotel and offer your services to help make their stay exceptional. You know your city better than most. Watch travel forums for people looking for advice in your area and start contributing content that will help make their stay incredible, whether they stay with you this time or not. Do you know the best place for breakfast? A great hike that’s not in the tourist guides? Let them know! Become a trusted member of the forum and, where appropriate, let people know why they should stay at your hotel. Is there a special event or a great deal that they shouldn’t miss? It’s ok to softly sell as long as you’re transparent and have provided valuable content so they know they can trust you. Closely monitor public Facebook pages, blogs and Twitter for people celebrating events in your hotel, such as birthdays or anniversaries. When they check-in, acknowledge the event with warm wishes and a bottle of wine or other amenity. If your property is pet friendly, treat Fido like the king his mom thinks he is. People love for their pets to be noticed and with more and more dog friendly hotels, you can make a big mark by catering to your furry guests. Deliver special dog bones to the room with a map of a nearby park. Many savvy hotels are already responding to online reviews but I can’t emphasise enough how important it is for all hotels to begin this practice. By responding, you send the message that you care about your guests’ experiences and you learn and grow from their feedback. Other ideas? Please comment below. 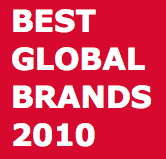 To read the whole InterBrand report about the top 100 brands, please click here. Great tips here, Michelle! I always believe service is your marketing – so the more ways we can make guests feel special the better. I think this is where monitoring becomes so important. Timing is everything when you’re acknowledging an event.